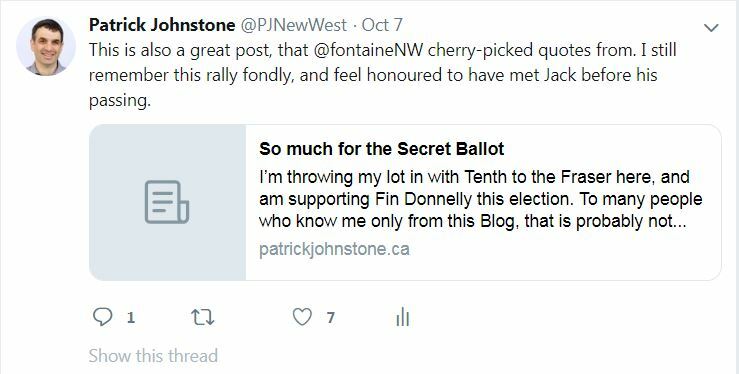 Posted on October 28, 2018 October 28, 2018 . by Patrick Johnstone. Leave a comment. 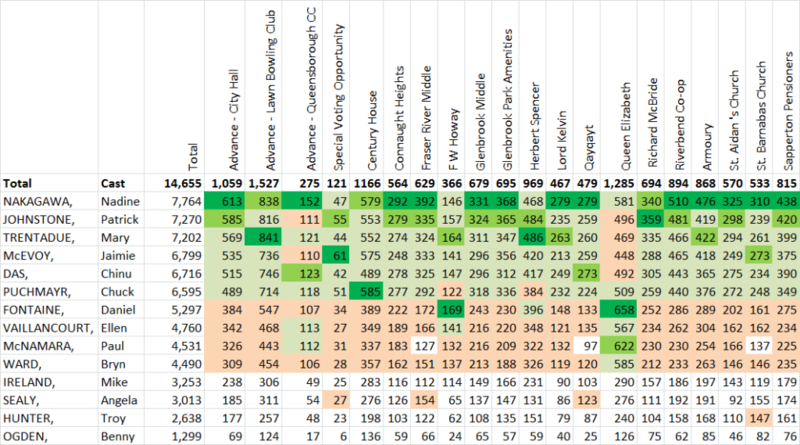 Messy data doesn’t prevent me (or some other local blogger) from trying to glean insight from it. No surprise here that overall winner Nadine Nakagawa won the most polls with 13 – she not only won the popular vote, she won the Electoral College! She was also the only candidate to “place” (finish in the top 6) in all 20 polls. She dominated. Mary Trentadue and Daniel Fontaine each won two polls, with myself, Jaimie McEvoy and Chuck Puchmayr each winning a single poll. I had far and away the most second place polls, and all of those elected “placed” in between 18 and 20 of the 20 polls. 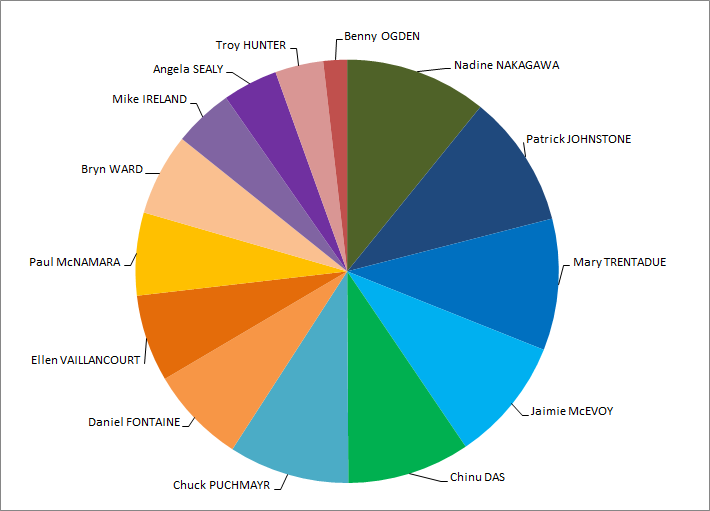 Team Cote candidates dominated almost every poll, except in Queensborough, and (arguably) Howay – the poll used mostly by Massey Victory Heights residents – where the New West Progressives (NWP) had a solid showing. People paying attention to the campaign will have noticed that the NWP put a lot of effort into Queensborough, stoking some discontent around a few long-standing neighbourhood grievances, and benefiting from support of a small but vocal group of Temporary Modular Housing opponents. Team Cote members also did a lot of work in Queensborough (I personally knocked on hundreds of doors there), though we can look back now and say that the ~200 vote gap between the best NWP candidate and worst Team Cote candidate in that neighbourhood was hardly a factor in the overall election result. 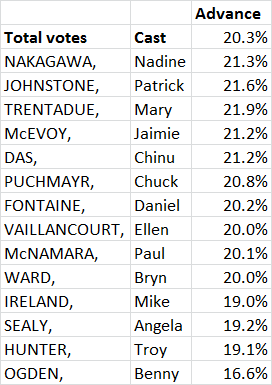 Interesting that Team Cote candidates received between 21% and 22% of our votes in the advance polls, NWPs around 20%, and others under 20%. I’m not sure if this relates to the relative get-out-the-advance-vote efforts, but it seems a consistent trend. 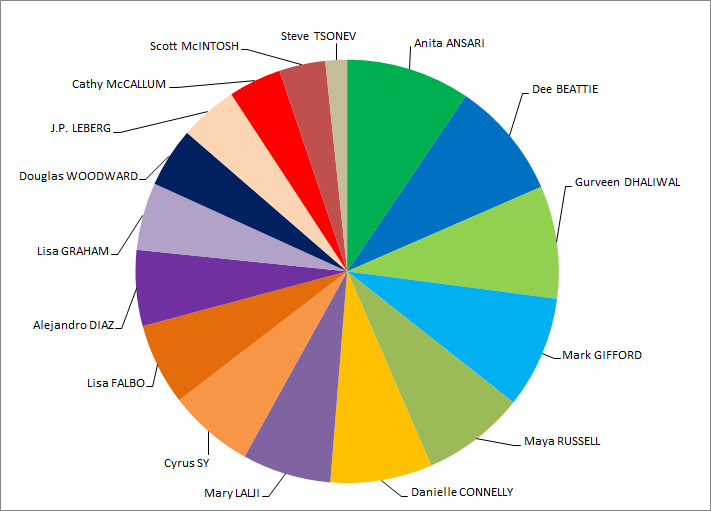 Overall winner Anita Ansari won 11 poll of the 20 polls, with Dee Beattie winning three and returning champions Mark Gifford and Mary Lalji each winning two. Queensborough resident Gurveen Dhaliwal won both polls in that neighbourhood. Beattie was second in most of the polls she didn’t win. NWP candidate Danielle Connelly didn’t win any polls outright, but did finish 2nd in three of them. Ansari was the only candidate to place in the top 7 in all polls, although Beattie only missed one (the Q’boro advance poll) as did Connelly (the Special Poll for hospitalized voters). Also note that the Team Cote candidates finished in alphabetical order – likely a coincidence, but fun to speculate about. Outside of the statistical analysis, I am struggling to write a piece about “what it all means”. As someone who did well in the election, I don’t want to be seen as punching down in my analysis of why others didn’t do well. I have had a lot of conversations with different people since the election, and have heard a lot of opinions about the result. 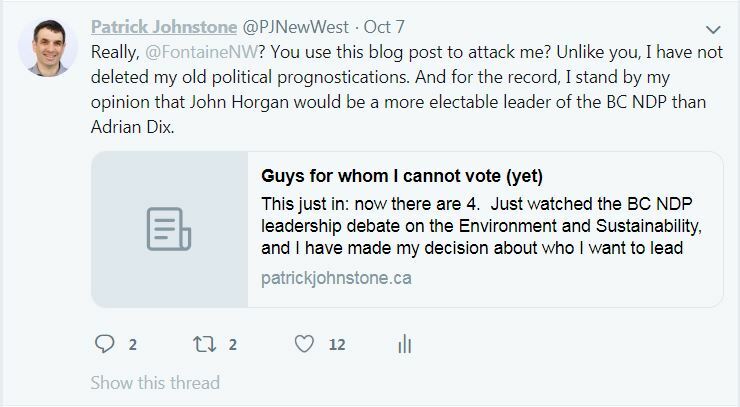 I am tempted read into New Westminster bucking the general regional trend of this being a “change election”, as seen in Port Moody, Vancouver, and Burnaby as a testament to the good work this Council has done, but getting out of my bubble a bit on this will be a challenge. Posted on October 24, 2018 . by Patrick Johnstone. 1 Comment. One of the discussions during this election (and in all local elections for the last few decades) was voter turnout. Already low across the region, there was some concern that this election would see even lower than usual turnout. We don’t have official numbers yet, but I thought it would be good to compare this year to previous years. There was some reason to suspect lower turnout this year. As charming and important as School Trustees and City Councillors are, it is really difficult for normal people and occasional voters to connect with that level of government. Occasionally, we have a candidate who is really compelling (I think of Jonina Campbell in 2011, Kelly Slade-Kerr in 2014) who drive some increased interest, but I doubt even that draws more than a couple of percent of eligible voters. Much like federal election interest is driven by the candidates for Prime Minister (sorry, Peter), the reality is that local elections often carry the weight of the Mayor’s race. And the reality is we didn’t have much of a Mayor’s race this year. Nothing against the challengers, but they all started very late and had limited campaigns (only one had lawn signs, one other had a website, and attendance at all-candidate events was spotty). I think in most people’s minds, even those who opposed him, Cote as a safe bet to win. However, there was also a reason to suspect turnout may be higher, and that was a well-coordinated and -funded party running in opposition to the existing Mayor and Council. There is good potential for a party with strong political connections and good messaging to drive turnout, both by their own efforts, and by forcing the incumbents to get off their duffs and work to keep their jobs. I knocked on almost as many doors this year as I did in my rookie year, and direct voter engagement – actually looking at people and telling them to vote – is the proven Get Out The Vote strategy. So how did that all work out? A note here, I am using the unofficial voter stats released by the City for 2018, and the City’s open data number for previous elections (we don’t yet have official numbers for 2018). I am also using population stats from the BC Government website. These numbers are not “voter turnout” in any official way. New Westminster’s population is about 74,000 people. We had just under 50,000 registered voters going into the election, though some of those people may have died, moved out of the city, or otherwise not been eligible to vote this election. There were probably a fair number of people who were eligible to vote but were not registered to do so, and registered on the day of the election. Short story: numbers are complicated, and everything below is an estimate. In short, voter turnout dropped in the late 1990s, turned around in the early 2000’s, and took until 2014 for it to catch up to the losses of the previous decade. 2018 turnout is slightly down in 2018 for Mayor and Council, and slightly up for School Board when compared to 2014. This does show the importance of the Mayors Race. 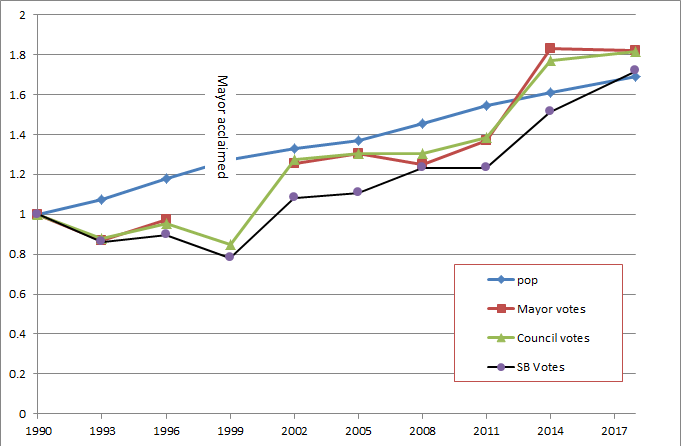 In 1999, the Mayor was acclaimed, and the School Board and council vote turnout suffered. The 2002 Election was an exciting affair with Wayne Wright unseating the incumbent by 18 votes, resulting in a jump in voter turnout across the board. The next three elections were relatively lackluster as a popular mayor won fairly easily, and the Council and School Board vote more or less flat-lined. (the 2008 School Board jump possibly related to the Grimston Park school controversy? Or am I getting my dates mixed up?). 2014 was again an exciting mayoral race with a strong-campaigning challenger unseating a popular incumbent. And much as I would think I am responsible for the huge jump in Council votes that year, the turnout across the board (if not my lackluster 5th place finish) belies this hope. 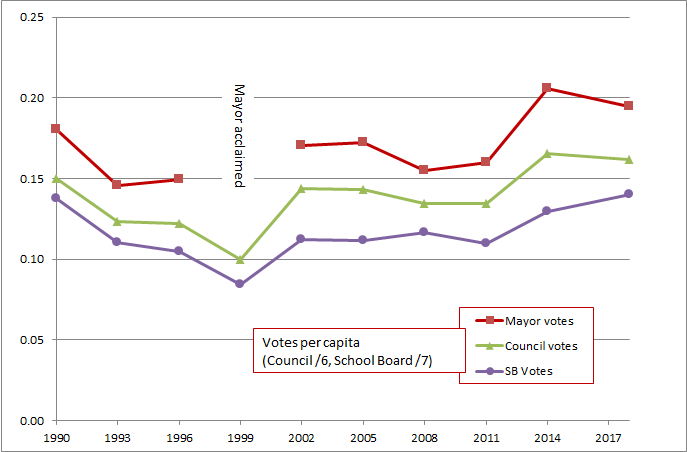 One thing that does stand out is uptick in School Board votes this year while Mayoral and Council votes were slightly down (on a per-capita basis). I would love to hear a theory to explain this. Good candidates? The fact they are finally pouring concrete for a new High School? Or perhaps it was because no group ran a full slate, so there was seen to be more room for challengers to get onto the board? Enter your theory here. Poll-by-poll results are yet to be released, and that is where the real fun is! I will write another piece once I get a chance to chew on them. Posted on October 23, 2018 October 23, 2018 . by Patrick Johnstone. Leave a comment. I have avoided talking too much about the election over here, relying on my election website to carry the campaign load while I kept this site on the day-to-day of council life. However, I am going to spend a bit of time between now and the resumption of Council stuff in November looking back at the election. On Council, Team Cote clearly dominated, not only taking the top 6 spots, but doing so with a clear numbers gap over the members of the NWP Party (6th place had 25% more votes than 7th place), who in turn had a pretty solid gap ahead of the 4 independent candidates (10th place had 38% more votes than 11th). 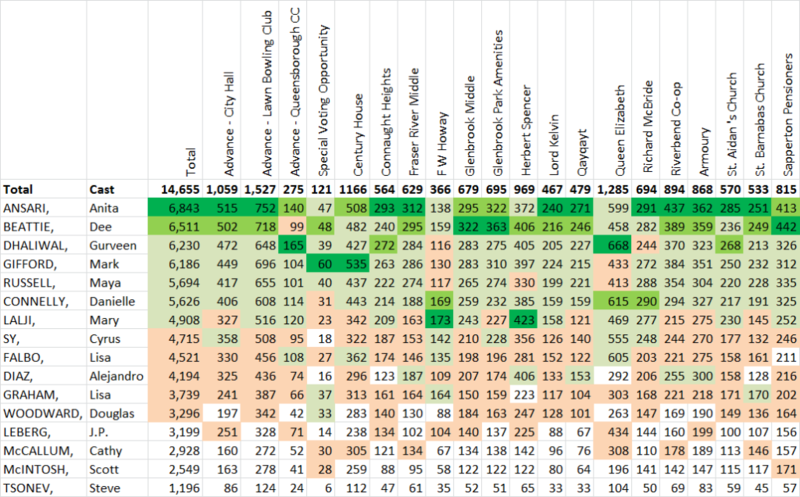 Voting percentages are a little wonky for Council elections because we don’t know how many votes each voter decided cast, but there were 71,627 council votes and 14,368 votes for Mayor, so we can infer an average of 5 votes per voter. 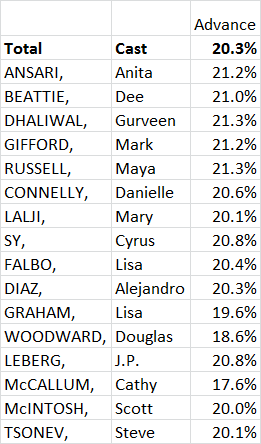 There were something like 50,000 registered voters in New Westminster, so turnout it tentatively a little over 28%, about the same as last election (the exact numbers will have to wait until the official report- as we don’t know how many voters registered on the day of the election) . The pie chart allows a little more clumping analysis. We can see that Team Cote candidates earned 59% of the vote total, NWP candidates 27%, and others 14%. 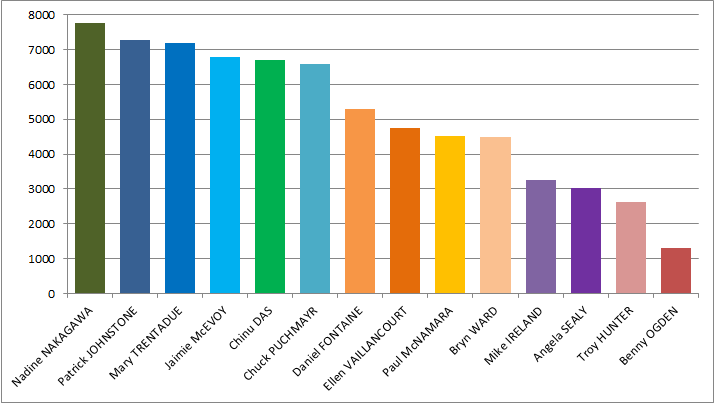 Of course, there were 50% more Team Cote candidates than the others, so perhaps a better comparison is that the average Team Cote candidate earned 9.9% of the votes, the average NWP candidate 6.7%, and the average Other 3.6%. Nadine Nakagawa surprised even herself by dominating the vote. 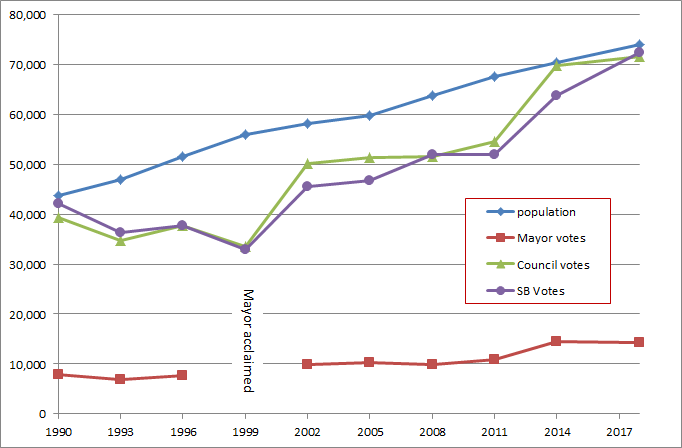 The last time a rookie candidate led the polls for Council was in 1996 when a young Jerry Dobrovolny pulled off the feat. 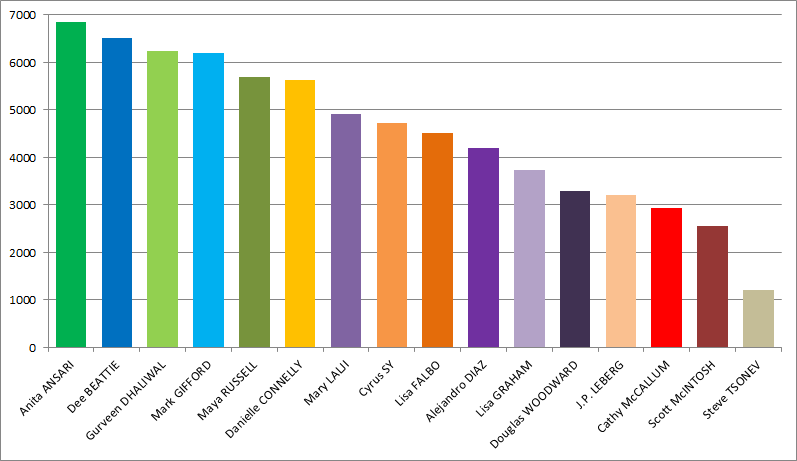 The vote count of all 6 elected Councillors (7,764 to 6,595) is quite a bit higher than last election (6,262 – 5,517), though the vote count for the 7th place finishers is not that different (5,297 in 2018, 5,165 in 2014). 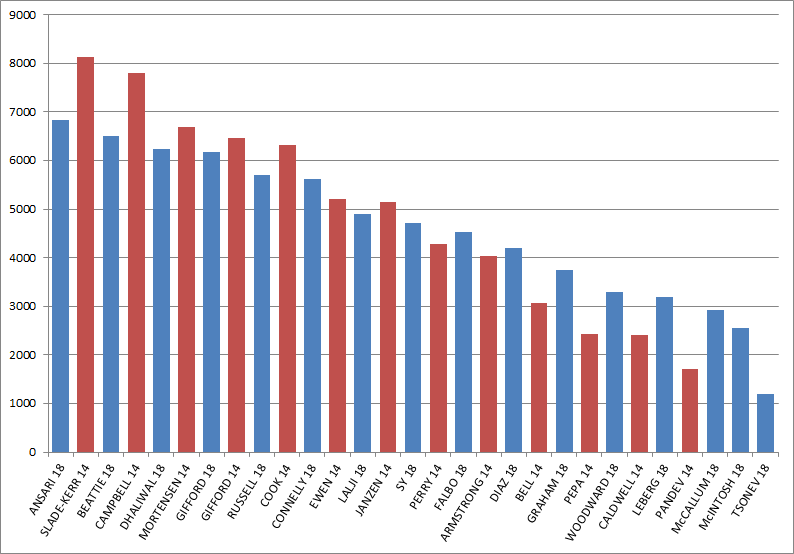 There were more candidates in 2014, which makes for a longer tail on the distribution, but this display really makes the gap between Team Cote candidates and others stand out – getting about 20% more votes than their cohort in the previous election, where the NWP had very similar vote counts as their 2014 cohorts. This was a convincing win compared to last election. There also isn’t a big gap between 7th place (and elected) and 8th place (less than 4%). The NWP candidates were not clustered, it is clear there was no “block vote” for or against the NWP. Danielle Connolly got 25% more vote than the NWP average, J.P.LeBerg got almost 30% fewer votes than that average. 43% of the votes went to Team Cote candidates, 25% to NWP candidates, and 32% to others. 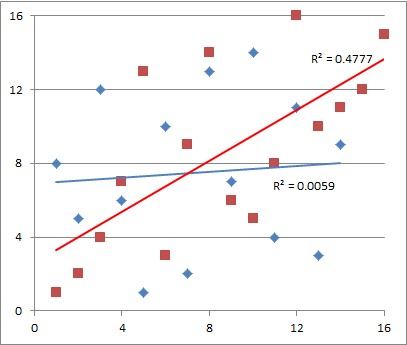 Again, since there were different numbers of candidates in those three clumps, the better estimate may be that the average Team Cote candidate earned 8.7% of the vote (and all were pretty close), the average NWP candidate 6.2% (with a wide spread), and the average Other 4.5% (with two candidates standing well above the average). The comparison between 2014 and 2018 is more interesting here than with Council. 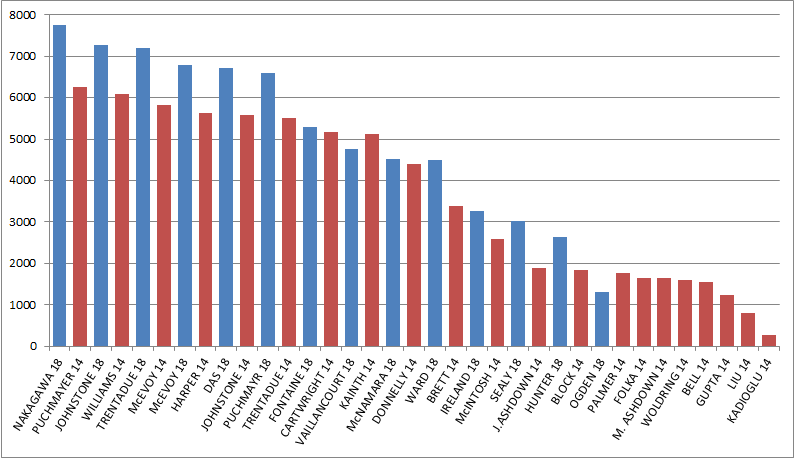 There were more votes in 2018 (about 14% more), but in contrast to Council, less of that vote went to the front-runners. With more candidates in 2018 the distribution is more spread out, but it will take a smarter political scientist than me to tell what this means! Finally, in a campaign where there was much discussion of how diversity was defined, all of the new candidates elected were women – three on City Council and six (6!) to the School Board. This, and the cultural diversity of the candidates, may be historic for New Westminster. Though it is worth noting that between 1993 and 1996, there were three women on New Westminster Council, and Betty Toporowski was Mayor. 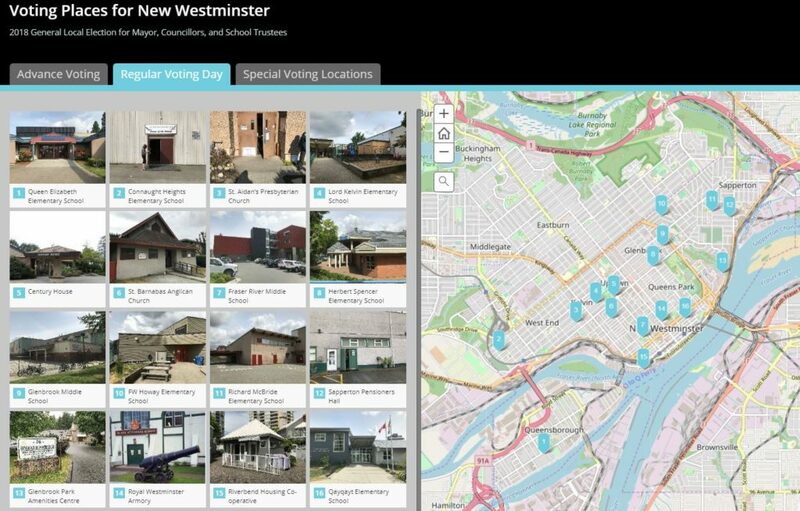 Whether a person of colour has ever served on Council in New Westminster is the kind of question you would need to ask an historian. Council – Oct 1, 2018. Posted on October 4, 2018 . by Patrick Johnstone. Leave a comment. Final! Council! Meeting! Of! The! Term! The City’s Public Engagement Taskforce created a strategy to improve how the City engages its residents and stakeholders in planning and decision making. We are a year into implementation, and have already achieved some of the short-term tasks like creating a Public Engagement staff position and developing a toolkit for all departments in the City to use in their own engagement. There is much work to do, however, and this report lays out our approach to the medium- and long-term tasks. This schedule shows a slightly reduced number of meetings compared to 2018. We had a bit of discussion about this, because we have had issues this year with extremely lengthy agendas, and fear that some of the items are not getting the fulsome review that is ideal. That said, meetings are expensive – they take a lot of staff time and resources, and that is time not being spent doing the other things staff have on their busy schedules. We need to strike a balance. Ultimately, I hope we can schedule a couple more daytime workshop meetings. We had great success this term with workshop format meetings on complex issues like the Heritage Conservation Area and cannabis regulations. We were able to debate, disagree, express our concerns and work with staff towards consensus. They were the most satisfying part of my Council experience, as they gave us a change to dig into policy implications of our decisions. Though we may not be able to predict what new strategic direction the new council will take, and therefore what the workshop topics will be, I hope to continue that trend. About 10% of New Westminster adult residents are at some time of the year food insecure. The City has been working with stakeholders and service agencies to help address this issue in the City as part of our larger anti-poverty strategy. Some will argue this is outside of the mandate of local governments, and indeed we are not the lead on this policy, but we do have a role in supporting the agencies who are experts at this work. We have occasionally failed in the past to manage parking provisions in some affordable housing/ market housing development, and this is currently causing quite a bit of conflict in one community in the City. As we work on that legacy problem, we need to assure we are not repeating the mistake, and make it clear to developers who are receiving development benefits in exchange for including affordable housing what the expectations are for parking, secure cycle storage, and general storage in those developments so that the people in the affordable housing portion are not nickel-and-dimed out of affordability. This report is good news. The ridership of the QtoQ Ferry is good enough (65,000 rides!) that it warrants an extension through the winter to determine if it is viable not just as a summer cruise, but as a transportation link. There are some details in here about challenges. One is determining how to make the waiting areas at each end more customer-friendly and less impactful on neighbours through signage (cues to help the QtoQ queues), and another is the challenge of Compass Card integration. We also need to get a long-term business plan together to decide what the best structure is for a permanent service if the winter ridership supports this. In the short term, we will continue running the QtoQ until May at the least, and will adjust the schedule somewhat to reflect expected off-season use patterns. Staff and the operators will continue to talk to the users to make the schedule as useful for those users. Ultimately, we need ot make this link work for them if we are going to make the case for long-term investment in the ferry service. Phase 1 of our Solar Garden is installed n the Queensborough community Centre roof, generating electricity, and paying back the investors (including me!). There is still public demand, so we are moving forward with Phase 2, likely to be located at the works yard in Glenbrook North. The Youth Advisory Committee has a different schedule than the other Council Advisory Committees, because we try to synch it to the school schedule. The 2018-2019 edition of the YAC is now struck. There is room for a few more members of the New West youth community – if you know someone between the ages of 13 and 19 who might want to tell City Council how to do or job better, send them here. Every year we review our various fees as part of our budgeting process. Almost all of them go up with CPI (“inflation”), but we also review them to assure we are recovering costs and to match with the fee structure in adjacent communities. In summary, Engineering fees going up 2% to match CPI, Business Fees, building fees and Planning fees will go up 2% with a couple of small exceptions (we are in the bottom 25% of Lower Mainland municipalities on these fees). Cultural Services fees are doing the 2% thing, and the fees we charge Lawyers and Notaries for tax records and other filings are going up more than 2% to align with regional averages. Due to CPI adjustments, the business licence rate for a Tea Cup Reader is now $47.87 per annum. I expect the Tea Cup Readers saw this coming, and have already raised their rates accordingly. The City has about $180 Million in the bank. Much of this is in reserve funds – money we have put aside for specific purposes (like the CGP replacement and DCC funds that must be used to expand utility capacity concomitant with population growth). We have drawn this down a bit over the last year, as we are spending it on the things it was saved for, like sewer separation in Sapperton and the Ewen Street project. This is our regular report on the return we are making on investments. As a City and for statutory reasons we are very low risk in our investment strategy, but the bond market is flat right now, so our finance department has moved some money to secure savings accounts. About 2/3 of the way through our year, we have reached about 66% of our budgeted return on investments. We will likely make about $2.3M in investment income this year. This is our ternary report on what the City purchased through sole source or public procurement. We are required by law to have an open bid process for most purchase and use BC Bid to do that purchase. If you bidded on a job at the City, and didn’t get it, here is where you can see who got the job and how much we paid them! This mid-rise mixed-use project on a vacant lot in Sapperton has been through extensive review and public consultation, and is now at the Development Permit stage. This is an exciting new landform for Sapperton, mixing commercial,retail and residential, and bringing a bit of new energy to East Columbia. I am happy to support it. This is a preliminary report: Council’s first view of a proposed project in Twelfth Street before it goes to internal reviews and public consultation. There is a lot going on here: passive house standard multi-family 6-story building, four more “missing middle” units, lots of family-size units, and a heritage house preserved as a transition to the adjacent residential neighbourhood. Coming soon to a public consultation near you! This is also a preliminary report for a project right next to the above one. It is a little more straight-forward in being all residential. This will no doubt raise some discussion about the role of residential at grade and retail along the Twelfth Street corridor. Coming soon to a public consultation near you! Another preliminary report. This is unprecedented in my time on Council, an application to expand the capacity of a recently approved building during its construction! There will need to be some review and public consultation here! This is one more – and almost the last – piece in the Port Royal development. It needs to go through DP and some variances for setbacks. Again, a preliminary info report with lots of review and public consultation to do! This is a preliminary info report – lots of review and public consultation to do! These Bylaws that support the recent changes in how the Tree Bylaw is administered were given second and third readings by Council. These Bylaws that support the fee changes described above were given three readings. This Bylaw that outlines the requirement for the affordable housing component of the approved development on Carnarvon Street was given three readings. This Bylaw that formalizes the properties exempt from property taxation was adopted by Council. This Bylaw that updates the 5-Year financial Plan to reflect some shifts in Capital project spending was adopted by Council. This Bylaw that returns HCA protection to this house in Queens Park upon the request of the homeowner was adopted by Council. This Bylaw that sets fines for violations of our Business License Bylaw related to cannabis retailing was adopted by Council. This Bylaw that closes a thin sliver of Clarkson Street to support the encapsulation of the SkyTrain line and the adjacent development was adopted by Council. These Bylaws that make it a requirement to pre-wire new residential buildings for EV changing were adopted by Council. Finally, this Bylaw that approves the zoning for the new Animal Shelter facility in Queensborough was adopted by Council. And that may or may not be my last council report! It’s been fun!